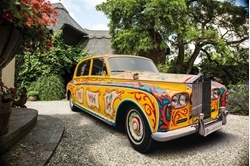 How John Lennon's Rolls-Royce Phantom V became a controversial custom classic . Beatles Radio: The Beatles, Solos, Covers, Birthdays, News The Fab 4 and More! Aren’t modern supercars gaudy? Roaring through Knightsbridge, brazen paint jobs startling the pigeons. Such a far cry from the coachbuilt class that used to count for a custom finish. In the good old days, going bespoke meant commissioning something elegant from your local coachbuilder. Maybe a nice open-top body for your Bentley or some special leather for your Aston. Perhaps a maroon-on-silver finish, if you were feeling bold. But a flamboyant amber wagon with a bed in the back? Absolutely not. And certainly not a Rolls-Royce. That’s like painting a moustache on a picture of the Queen. Or re-coating Tower Bridge in lime green. How can a car project the stoic understatement of the British establishment when its shell is the colour of mustard?